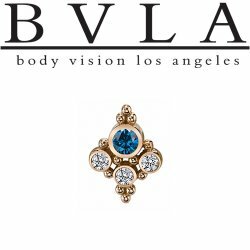 BVLA Gold Threadless Ends. 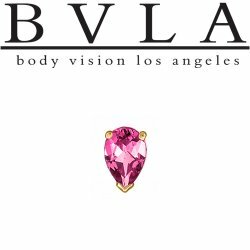 "Press-fit" gem ends. 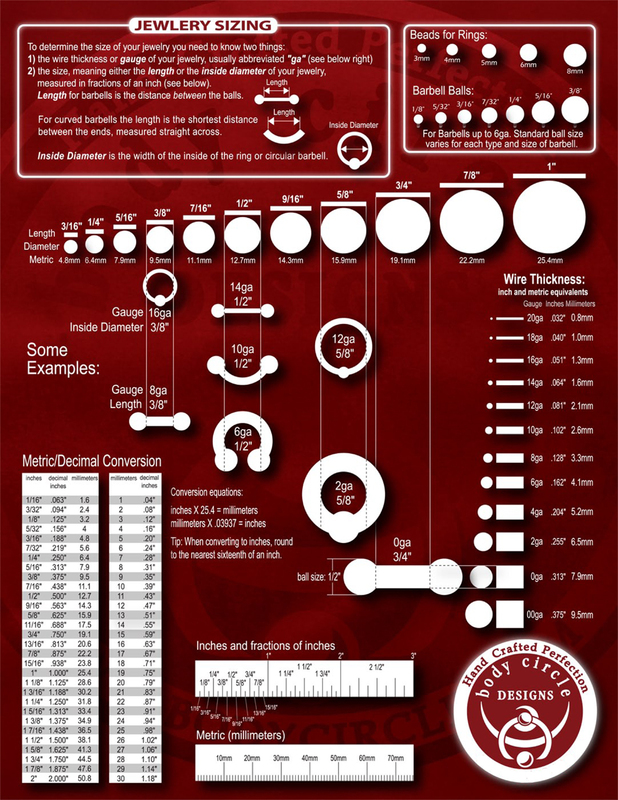 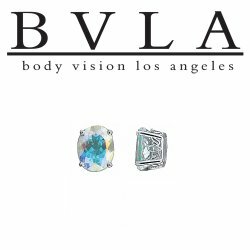 The threadless or "press-fit" system is an effective alternative to internally threaded body jewelry and is currently in wide use by many body piercers. 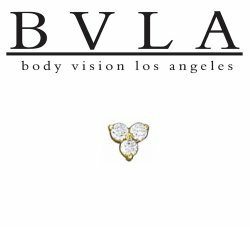 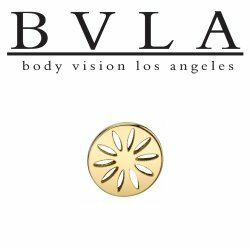 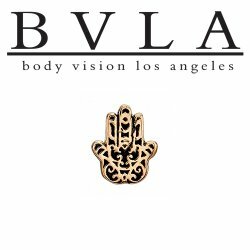 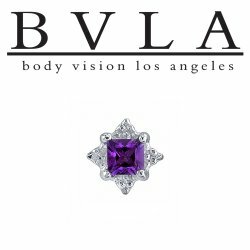 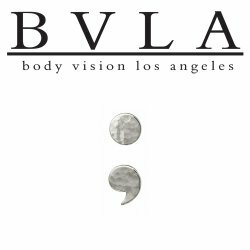 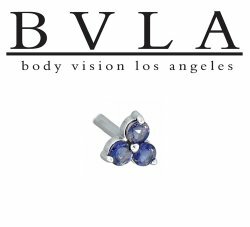 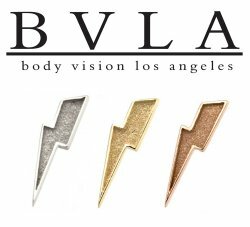 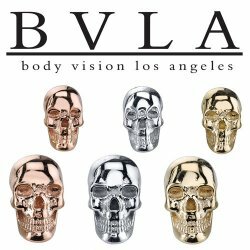 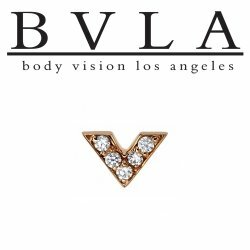 All BVLA body jewelry is custom order and hand made in Los Angeles, CA. BVLA 14Kt Gold "Storm Trooper" Threadless End 18g 16g 14g "Press-fit"
BVLA 14Kt Gold "Sun" Threadless Gem End 18g 16g 14g Body Vision Los Angeles "Press-fit"
BVLA 14Kt Gold "Terrace" Threadless End 18g 16g 14g "Press-fit"
BVLA 14kt Gold "The Rose" 6mm Threadless End Genuine Diamonds 18g 16g 14g "Press-fit"
Item over $500, please CONTACT US FOR PRICE! BVLA 14Kt Gold "Tiny Nanda" Threadless End 18g 16g 14g "Press-fit"
BVLA 14Kt Gold "Tiny Nanda" VS Diamond Threadless End 18g 16g 14g "Press-fit"
BVLA 14Kt Gold Hammered "Semicolon" Threadless End 18g 16g 14g "Press-fit"
BVLA 14Kt Gold Low Profile "Skull" Threadless End 18g 16g 14g "Press-fit"
BVLA 14kt Gold Marquise Fan 3mm x 1.5mm Gems Threadless End 18g 16g 14g "Press-fit"
BVLA 14Kt Gold Micro Pave "Heart" Outline Threadless End 18g 16g "Press-fit"
BVLA 14kt Gold Micro Pave "V" Chevron Threadless End 18g 16g 14g "Press-fit"
BVLA 14kt Gold Oval Gem Scroll Prong Threadless End 18g 16g 14g "Press-fit"
BVLA 14kt Gold Princess Mini "Kandy" Threadless End 18g 16g 14g "Press-fit"
BVLA 14kt Gold Prong-set Pear Cabochon Gem Threadless End 18g 16g 14g "Press-fit"
BVLA 14Kt Gold Relief Sandblasted "Lightning Bolt" with Raised Edges Threadless End 18g 16g 14g "Press-fit"
BVLA 14Kt Gold Round "Pentagram" Threadless End 18g 16g 14g "Press-fit"
BVLA 14kt Gold V Prong-set Pear Gem Threadless End 18g 16g 14g "Press-fit"
BVLA 14kt Gold "Tri Prong Cluster" 1.0mm Gems Threadless End 18g 16g 14g "Press-fit"
BVLA 14kt Gold "Tri Prong Cluster" 1.25mm Gems Threadless End 18g 16g 14g "Press-fit"
BVLA 14kt Gold "Tri Prong Cluster" 1.5mm Gems Threadless End 18g 16g 14g "Press-fit"
BVLA 14kt Gold "Tri Prong Cluster" 2.0mm Gems Threadless End 18g 16g 14g "Press-fit"
BVLA 14kt Gold "Club" Card Suit Threadless End 18g 16g 14g "Press-fit"
BVLA 14kt Gold "Hamsa Hand" Threadless End 18g 16g 14g "Press-fit"
BVLA 14kt Gold "Hamsa Hand" with Gem Threadless End 18g 16g 14g "Press-fit"
BVLA 14kt Gold Round "Sarai" Threadless Gem End 18g 16g 14g "Press-fit"